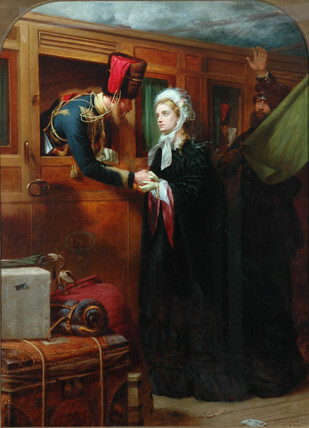 Oil painting by Robert Collinson (1832-1890), showing a woman standing on a railway station platform saying goodbye to a soldier departing by train to the Crimean War (1854-1856). During the Battle of Balaclava on 25 October 1854, the Light Brigade charged the Russian artillery ranks. The British sustained very heavy losses during the charge, due in part to misunderstanding the order given by the commanding officer, Field Marshall Lord Raglan (1788-1855), to recapture guns stolen by the Russians.